Cool things to do with one piece of paper. 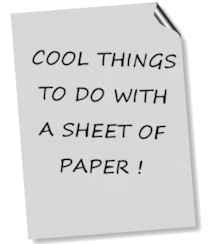 Here is our list of some very cool things to do with one piece of paper. Make the Red Baron's triplane - cool! I like the baubles! Very cool but remember to use thicker paper if you make them larger. One sheet of paper is all it takes to set your imagination free. Some of these craft projects require glue and scissors too. 1. The Floating Paper Ball. The "Floating Paper Ball" is a great trick to perform with a piece of paper. You (the magician) should crumple a piece of paper into a ball, and hold it, palm upwards, on your left hand, with your right hand above it. You will wave your right hand above the crumpled ball in a mystical fashion and remove your left hand. Your audience will watch the ball remain hanging in space for a few seconds before you reach down and take the ball in your right hand.You can pass the ball for their inspection. A thin line of thread, the same colour as your shirt or jacket top (black is best) is looped from a safety pin in the collar over your ear. When you first crumple the ball, scrunch it around the loose thread and it will hang from it with ease. When you finish, slide it off the thread as you hand the paper over for inspection. Finally brush back your hair with your right hand and discretely lift the loop from your ear. The thread will fall to the floor and will not be noticed.